I had thought tonight about sitting down and writing about Common Core Curriculum Standards and the conference I attended on Thursday. I have been thinking about it a lot since – and its implications for your children and mine. I will write that blog entry soon – but right now is not the time for that. Right now I am emotionally full with the sense of impending endings and summer’s beginning. All of a sudden, here we are, with two weeks left of school before we hug our goodbyes and wish each other well. It is time and the children are ready. They burst in and out and fill our walls with their energy and friendship and exuberance. There are parts to this time of year that I love – and yet, there never seems to be enough time and now when I look at your children who are leaving, I am filled with love for them as they take off for their next journey. 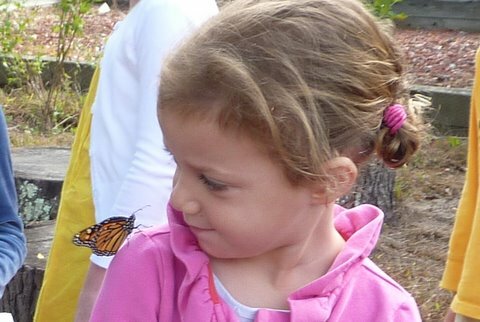 The monarch butterfly project that we do every fall with the children is now metaphorical for their time with us at CNS. Here we are taking care, making sure they get the nutrients that they need; making sure that their environment is safe and free from harm; allowing them to grow and change and emerge. They have been in chrysalis now for awhile…and they are about to emerge, dry their wings and fly off. It is beautiful and right – but those of us here who have been this part of their journey – their milkweed; their stem; their shelter – we will miss them. There is something so very precious about your children. I truly feel unbelievably humbled and grateful for their friendship. I know them all. And I have the best job in the world to know them. On Friday I was at a Bridge school event and a couple of Bridge students – CNS alum – came to me to say hello; and some current CNS children were there – and it was so fun to see them, too. The bonds we create are lasting and special and real. The children feel them and so do we. And now we must prepare for their emergence – their wings are drying off and they are ready to fly. And so we watch with our hearts and our eyes getting misty – and filled with pride and love for them. And just like when we watch that baby monarch reach up to the sky and begin her journey to Mexico – we are awed by how your beautiful children are ready to spread their wings and fly on to their next most special destination. We will also miss all of you – your dedication and support for our school is an incredibly special part of what we do at CNS. We would not be able to do what we do without you – the parents. Thank you for sharing your journey with us – many of us did the same and our lives have been forever changed. Stay in touch. Drop by. We will be missing you. But until then – let’s make the most of these two weeks…despite what ‘needs’ to be done – let’s enjoy every conversation and take time with each other before life and, you, too fly away.